Argentina’s native white varietal. Intense perfumed aromas of tropical fruits, spring flowers and notes of roses. This is an elegant and complex wine with a rich, mellow, fruity taste and clean, crisp finish. Lychee and a note of fresh green veggies define the nose on this wellmade Torronts from Salta. A lemony palate is snappy but also oily, which is common for this grape type. Salty nectarine and lychee flavors hold steady on a developed finish. Pale, bright yellow. Lemon, pear, herbs and yellow flowers on the nose. Supple and fairly substantial but bright and dry, with the citrus fruit and floral character carrying through on the palate. 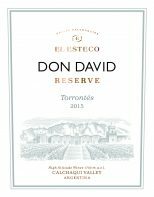 This has a textural richness that was difficult for Torronts producers from outside the Salta region to achieve in 2016.